ITF general secretary Stephen Cotton responds to ver.di’s announcement that it has concluded a collective bargaining agreement with the low-cost airline. I applaud our affiliate union ver.di on signing a collective bargaining agreement with Ryanair, covering all Germany-based cabin crew. This deal opens the way to fair labour standards in one of the airline’s largest markets. Last July, ver.di became one of the first unions to achieve recognition from Ryanair, leading to a lengthy period of negotiations. At points the employer’s intransigence threatened to destabilise the process, and both cabin crew and pilots were forced to take industrial action in Germany in September. Nevertheless, the dogged perseverance of both workers and union has ultimately led to a deal which, among other improvements, will ensure a stable basic salary. Thanks to the German government closing a loophole in national labour law last autumn, Ryanair and other airlines will also be subject to a works council on the same terms as other sorts of employers. This represents a major campaign victory for ver.di, which has long argued that aviation workers deserve the same rights as their counterparts in other sectors. However, the airline is still unacceptably holding out against fulfilling its obligations. It must fully accept the authority of German law. Overall, progress is being made at Ryanair. A quarter of the workforce is now covered by collective bargaining, and half by agreements to implement national minimum standards. And under great pressure from unions and shareholders alike, controversial chairman David Bonderman is stepping down next year. However, the company still has a long way to go before it can be considered a good employer. 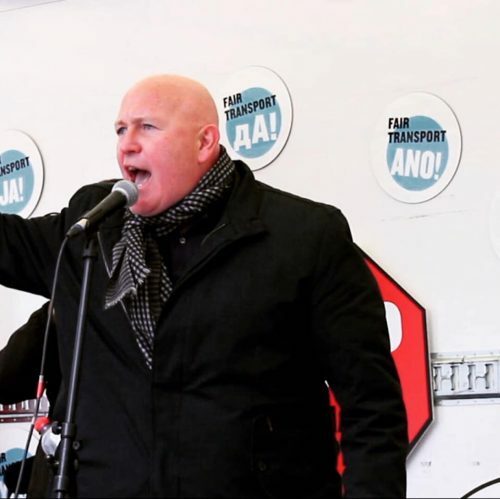 It is fitting that this agreement comes in the final week of the ETF’s Fair Transport Europe campaign, where transport workers have taken to the streets of the EU capital to demand fair pay and conditions. Ryanair should follow the example set in Germany and conclude collective bargaining agreements with unions in all countries it operates, bringing its industrial relations into the 21st Century.